Learn to thrive in today’s business world. The Bachelor of Commerce is one of the largest undergraduate business programs in Canada. On a N.O.W. Plus pathway, you can complete the 90-credit program in just six years or less. Sharpen your critical thinking, analytical, communication, and leadership skills — all vital for success in today’s competitive business environment. Learn from experts in the field, many of whom are active in the Canadian business sector and hold professional designations. Gain valuable insights from your instructors’ real-world experiences. Develop a global view by working with students from around the world. Combine theoretical knowledge with applications, preparing for the demands of working in a constantly changing world. Acquire the analytical and research skills needed to make sense of the issues that shape society. Understand the impact of academic research through professors who are engaged researchers in the field. 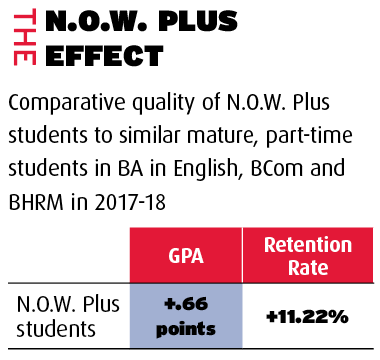 Find support through the Atkinson Centre for Mature Students, York International and New College, in addition to the specialized supports offered through N.O.W. Plus. N.O.W. Plus is designed to help working adults earn a degree without disrupting their careers. You’ll have spots reserved in core Night, Online, and Weekend commerce courses, and you can take daytime courses if your schedule allows. To earn a Bachelor of Commerce, you’ll need to earn 90 credits. The specific courses you need to take will depend on which electives and optional courses you choose. Courses are typically worth three credits each. When applying to the Bachelor of Commerce, you’ll want to ensure you have the math prerequisite required for admission to the program. Successful completion of grade 12U high school math course Advanced Functions MHF4U or the Math for Admissions course . If you are unable to come to campus, contact us for other options. N.O.W. Plus degrees are eligible for the same financial aid options open to other part-time students enrolled in the Bachelor of Commerce or Bachelor of Human Resources Management.